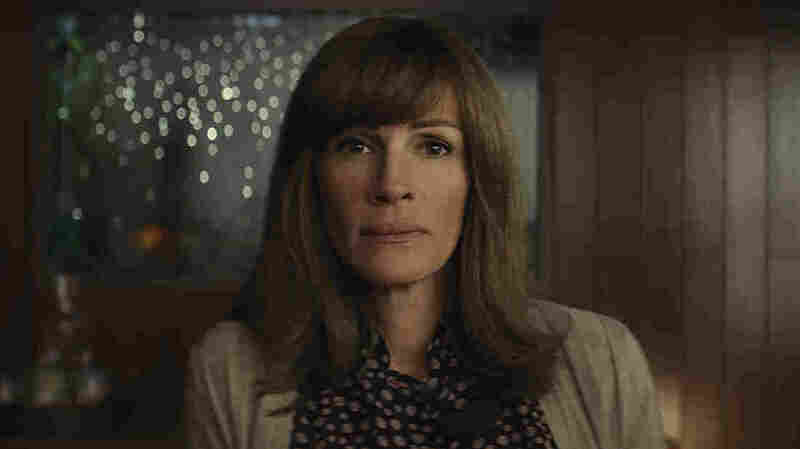 Review: Julia Roberts Stars In Amazon's 'Homecoming' Julia Roberts headlines Amazon's thriller about a mysterious government program offering treatment to veterans. Sam Esmail, fresh off creating Mr. Robot, brings a thoughtful visual style. Julia Roberts plays a caseworker at a mysterious government facility treating veterans with PTSD in Amazon's Homecoming. Television has been asking this question a lot: What should we do with terrible memories? Should we resign ourselves to being stalked by them, like the family in Netflix's The Haunting of Hill House? Should we just acknowledge that we will walk with apparitions and that the ghosts of our own mistakes will snuggle into our beds and put their cold fingers on our bellies while we sleep? Should we turn them against ourselves, like the protagonist of HBO's Sharp Objects? Should we tear into our bodies and carry bottles of anesthetic and cover all the evidence with long sleeves? Amazon's new ten-part thriller asks this question, too. When we first meet Heidi Bergman (Julia Roberts), she is working in a program — like the series, it's called Homecoming — set up to transition veterans into their post-service lives. Many have PTSD or other symptoms of trauma, and it's the job of counselors like Heidi, the program says, to help process their worst memories and prepare the soldiers to move on. One of those soldiers is Walter Cruz, played by Stephan James. James played John Lewis in Selma and Jesse Owens in Race, and he will soon break your heart in Barry Jenkins' Moonlight follow-up, If Beale Street Could Talk. Here, where Heidi is placid and full of platitudes at first, Walter is playful with her, funny and curious, and she likes him. They like each other. Meanwhile, Heidi is getting impatient phone calls from Colin, her boss. Colin is an insufferable, arrogant suit with a slick hairdo on top played by the versatile and reliable Bobby Cannavale. Always about three feet ahead of disaster, Colin presides over dismantlings of rooms and awkwardly choreographed meetings, all while shouting into the phone that Heidi had better keep the project on track. There is a story told in parallel in which Heidi, some time later, is working in a diner. She has left the program, and when an FBI investigator (Shea Whigham) comes to ask her some questions about it, she doesn't want to talk. She doesn't even seem certain what she would say, were she to say anything at all. She might not even know the things he wants her to tell him. We move back and forth between Heidi at the facility and Heidi at the diner, drifting in time, uncertainly. The creators of the TV series are Micah Bloomberg and Eli Horowitz, who wrote the Gimlet Media podcast on which the show is based, and Sam Esmail. Esmail is best-known to TV audiences as the creator of Mr. Robot, the well-regarded USA series starring Rami Malek as a hacker. While Homecoming has one framing device — as in the actual aspect ratio, not a narrative framing — that recalls his unconventional direction of Mr. Robot, it's more restrained and calls a bit less attention to itself visually. There are split screens here and there, and the final episode has a dynamite montage that's all the more effective because it doesn't come at the end of a series of flourishes. But Homecoming is a bit more relaxed, even though the opening and closing sequences of each episode are stunning ultra-short films in and of themselves. Roberts has very little access to her smile in this role — her big smile, the one that helped make her famous. This performance emphasizes a more melancholy note that has always been present in her work, even in roles like the one she had in Notting Hill. Here, Heidi is troubled by what she's doing, almost always, and as Heidi is resisting the charm magnet that is Walter Cruz, Roberts is also downplaying her sparkle opposite the charm magnet that is Stephan James. They have a chemistry that's unconventional but compelling, and that makes her internal conflicts over the fact that he's involved with this program feel genuine. Because of course this program is not exactly what it appears to be. This much, you will know instantly. And you will wonder whether you are waiting for a reveal that will, like some reveals in Mr. Robot, feel anticlimactic or unearned when it arrives. Note well: you are not. This is a mystery, and it has answers, but those answers don't invalidate everything that's come before, and they don't deflate the stakes, and the story is not a trick. Roberts, James and Cannavale shine here, but there are some supporting performances that are so good that they might have benefited from even a little more development. I would have happily spent more time with Marianne Jean-Baptiste as Walter's mother, who trusts none of the government people allegedly trying to rehabilitate her son, or with Sissy Spacek as Heidi's mother. Dermot Mulroney, who plays Heidi's boyfriend-ish person, plays against type nicely, but what he's doing in the story is a little nebulous. And without spoiling anything, it seems like there might be a second season with more to do for Hong Chau, who plays a colleague of Colin's, but here, she doesn't get a lot of room to stretch her legs until very late in the game. This is a well-executed mystery that avoids a lot of the pitfalls of both mystery shows and science-fiction-tinged shows: it's not overdetermined, it's not overcomplicated, and it's not suddenly upending itself in episode eight, making all the previous action irrelevant. The performances are terrific, Esmail is brilliant director of television, and there's good reason to believe this may just be the show Amazon will use to mark its drama brand, the same way it's used The Marvelous Mrs. Maisel to boost its comedy brand. It's neatly composed, it's frequently unsettling, and it suggests that figuring out what to do with our terrible memories is more complicated than even a ghost story might contemplate.